The X-37B…Some Answers….A Recon Bird? That ‘thing’…… seems to be recon…. Several amateur astronomers have found the truck sized space vehicle orbiting the planet….. It is being maneuvered by the Air Force’s Space Command……. From New York to Iran and Afghanistan….. The X-37B can stay up for up to 187 days….. There are secrets about its payload specifics…but if spacecraft is up there….the ‘skywatchers’ and other governments know where it is……. Last month, the unmanned successor to the space shuttle blasted off from Florida on its debut mission but attracted little public notice because no one knew where it was going or what it was doing. The spaceship, known as the X-37B, was shrouded in operational secrecy, even as civilian specialists reported that it might go on mysterious errands for as long as nine months before zooming back to earth and touching down on a California runway. In interviews and statements, Pentagon leaders strongly denied that the winged plane had anything to do with space weapons, even while conceding that its ultimate goal was to aid terrestrial war fighters with a variety of ancillary missions. The secretive flight, civilian specialists said in recent weeks, probably centers at least partly on testing powerful sensors for a new generation of spy satellites. In six sightings, the team has found that the craft orbits as far north as 40 degrees latitude, just below New York City. In theory, on a clear night, an observer in the suburbs might see the X-37B as a bright star moving across the southern sky. In moving from as far as 40 degrees north latitude to 40 degrees south latitude, the military spacecraft passes over many global trouble spots, including Iraq, Iran, Afghanistan, Pakistan and North Korea. Mr. Molczan said team members in Canada and South Africa made independent observations of the X-37B on Thursday and, as it turned out, caught an earlier glimpse of the orbiting spaceship late last month from the United States. Weeks of sky surveys paid off when the team members Kevin Fetter and Greg Roberts managed to observe the craft from Brockville, Ontario, and Cape Town. Mr. Molczan said the X-37B was orbiting about 255 miles up — standard for a space shuttle — and circling the planet once every 90 minutes or so. 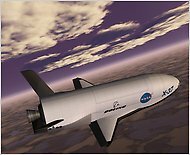 A fair amount is known publicly about the features of the X-37B because it began life 11 years ago as a project of the National Aeronautics and Space Administration, which operates the nation’s space shuttles. The Air Force took over the program in 2006, during the Bush administration, and hung a cloak of secrecy over its budget and missions. The X-37B has a wingspan of just over 14 feet and is 29 feet long. It looks something like a space shuttle, although about a quarter of the length. The craft’s payload bay is the size of a pickup truck bed, suggesting that it can not only expose experiments to the void of outer space but also deploy and retrieve small satellites. The X-37B can stay aloft for as long as nine months because it deploys solar panels for power, unlike the space shuttle. The X-37B……The Air Force moves into the post Space Shuttle mode…. President Obama will not extend the aircraft……. 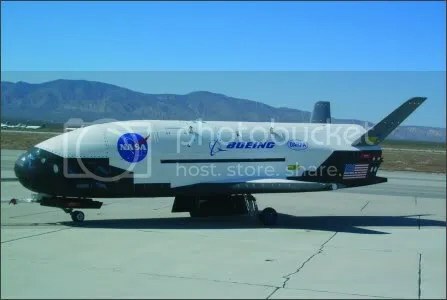 The Air Force it seems is concerned that they will not have a space truck to make delieveries….so they have dragged out a old program almost cancelled when the shuttle started doing its work…..The X-37B……. This spaceplane looks surprising like the Shuttle , right? The quietly scheduled launch culminates the project’s long and expensive journey from NASA to the Pentagon’s research and development arm and then to a secretive Air Force unit. The launch date, landing sites and a fact sheet were released by Air Force spokeswoman Maj. Angie I. Blair. She said more information would be released soon, but questions on cost and other matters submitted by e-mail weren’t answered by Friday. This is a repost……from April 4th…..The Aircraft was mentioned on MSNBC today…..
An addition pice from usatoday on a launch of the aircraft.…..ah, Spacecraft…..